REELRADIO - The Don Blesse Collection! Christmas 1963: A gift of a little red Japanese transistor radio with a black leatherette case was the root cause of my lifelong dementia. A friend who had also had received a similar gift told me about this great radio station he just discovered.... WABC. I was hooked! 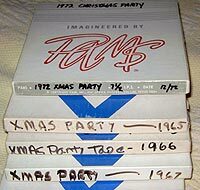 The music... legendary deejays like Dan Ingram, Scott Muni, "Cousin" Bruce Morrow... and those great PAMS jingles. Growing up in Central New Jersey, we got to hear New York radio up close and personal. For most of my youth, it was WABC that ruled, but there the other legendary stations, and, if you were willing to brave a little static, you got to hear the battle between WFIL and WIBG down in Philly. At night, other legends: WKYC, WLS, WCFL, WPTR, WKBW, and CKLW skipped their way into my radio. 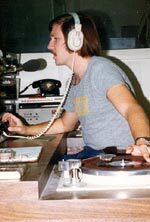 After a year's worth of hanging around and doing gofer work at our local radio station, I got my first paying radio job in the summer of 1972, making a whopping $1.25 an hour, doing weekends at MOR/Easy Listening WRLB-FM (Now WWZY) in Long Branch, N.J. Later that year, I went off to Ohio University in Athens, Ohio where I learned that at OU's School of Radio-Television, there were dozens of other radio geeks that were similarly hooked. During my years at OU, I became an avid jingle and aircheck collector. While finishing up my degree, I signed on as AM drive jock at Full-Service MOR WATH in Athens. After six months, I was deemed by station management to be "not ready for drive time" and got what Bill Drake once referred to as "The inevitable Batphone call" (read: "You have been terminated!"). Figuring it paid more than unemployment, I "temporarily" took a sales position up the road at WXIL-FM Parkersburg in the fall of 1976. I moved on in the summer of 1977 to a sales gig, and later sales manager at WQIO (now WILB) in Canton. Just prior to the station's sale, I got the Batphone call again, and made the move to Cleveland and a sales job at WJW (now WKNR). Since 1985, I have been in varying sales and sales management positions at 50kw News/Talk WTAM Cleveland (formerly WWWE). I'm happy to be "just a salesperson" these days of consolidation. The Repository thanks Don Blesse for sharing!
. . . It's on tape, guys . . .
Back in the heyday of PAMS, the production guys would put together a collection of outtakes, bloopers, and other off-the-wall humor for playback at the annual company Christmas party. Here is the 1972 edition. Among other things, you'll hear some great outtakes, including an impromptu U.S. Army "Go AWOL" jingle and a disastrous attempt by Dallas' finest vocal professionals attempting to sing "Happy Birthday" in thirteen takes or less. Also included is an aircheck of WABC's Dan Ingram playing a medley of his jock jingles, the "real" story of Bill Meeks' return to college, and the musical answer to the question, "What does a Scotsman have under his kilt?"
. . . I've got a problem, you see, I want to work for TM . . . In the mid and late 70's, Ken Justiss was one of the creative forces driving TM Productions and then he went on to be one of the founders of FirstCom. Now, hear the audition tape that got Ken the gig right out of college. It showcases Ken's editing prowess, as well as his home-brew Sonovox and Moog work. This tape was rumored to have been done in Ken's basement using home equipment.
. . . from the only station BIG enough to make it happen . . .
You may recognize the story: A 5,000 watt Ohio family-owned radio station perennially finishes last in the ratings. Tired of losing for over thirteen years, the general manager (who happens to be the son of the owner) hires a hotshot out-of-town program director to take the station Top 40  and turn it around. This all happened in the fall of 1976� two years before WKRP In Cincinnati hit the small screen. It was WQIO in Canton, Ohio  a 5,000 watt daytime-only radio station that managed, in eighteen months, to take the station's share from a 0.5 to a 7.0  up against entrenched local competition and also in the shadow of such legendary Cleveland signals as WGAR, WWWE, and WMMS. This little station had a major market sound with a minor league budget while attracting a fair amount of national attention during a four-and-a-half year run. With a new FM competitor in town, here's Q-10's attempt to hang on during the waning days of AM Top 40 radio.
. . . What have you done for Altoona? . . .
As a jingle collector for almost thirty years and an aficionado for even longer, I've noted over the years the myriad of jingles produced for radio stations about the communities in which they're located. This collection highlights some of the better examples. The long and the short  from the 50's to the present  from the serious to sublime  and from the various production houses that existed over the years. One of the more ambitious early projects was PAMS Series 16 "Sound Of The City." 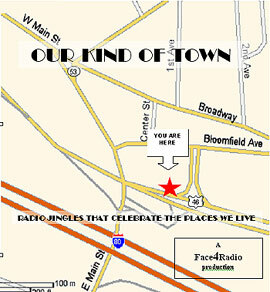 This 1960 package sought to link the station to the community it served. It also featured a record-length song about the city which some stations added to their song rotations and distributed as 45 rpm records. KNUZ in Houston sold over 4,000 copies in a week! The genre flourished during the mid-60's with some memorable songs from the likes of Sande & Greene, Chuck Blore, and Hugh Heller. While 70's radio was generally characterized by short jingles or none at all, projects like TM's Sound Of Chicago and Listen To Your City and JAM's I'd Rather Be... series kept radio listeners singing about their towns. The songs have kept on coming and you'll hear works from the 80's and 90's as well. The final cut is a custom cut done by JAM in 1979 for WYNY New York. By length and production value alone, it would have already been a contender as the grand finale. The events of September 2001, however, make it a particularly appropriate ending for such a compilation. Thanks go to Mike Neff, Mark Biviano, Bill Schenold, Kevin Slater, and others who have contributed material over the years that went into this collection, as well as Tom Corbett and Jonathan Wolfert who assisted in identifying some of the cuts. The audio quality varies. Some cuts are first generation dubs from the masters or digital clones from CD. Others show the effects of multi-generation dubbing, magnetic tape deterioration, or simply the archaic recording technology of their time. We hope you'll forgive a little harmonic distortion here and there. The Repository first presented The Don Blesse Collection on November 8, 2004.